A soup with pork entrails as one of the main ingredient can intimidate the most adventurous among us, especially when it’s just off the streets. But this is where locals are queuing up. No white linen, no silver cutlery and no dressed-up servants bringing you pre-heated plates and a welcoming Sir thrown over the table. What you see is what you get. A wobbly metal table, that you might have to share with others, and a far too small/low plastic stool (if it can be called a stool). And the soup. Of course. But the soup makes up for everything else. The very peppery and clear broth is absolute delicious, the noodles are the large rolled once, and the pork belly has a taste and consistence making you want to fill a small bag for some snack on your way home. And yes, don’t worry about the entrails, they are good too. Sometimes I choose with, sometimes without (with the risk of being called a rookie). But as with anything else, it depends on the mood. You find Nay Lek just at the entrance of Soi 11. Delicious street food. Kuay jap is really a hearty soup that combines a deliciously peppery broth with chunks of crispy pork belly – in addition to the entrails/offal. It is very tasty and you might easily end up with asking for a second portion. You won’t be the first one doing just that as his Kuay jab is one of Yaowarat Road all time favorites among locals. 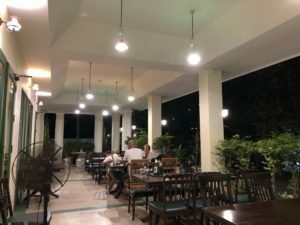 Nay Lek only serves one dish, and maybe that’s the reason for their success, they have spent a lifetime in finding the balance of all the ingredients involved. Some places serve this dish without noodles and with a bowl of rice on the side. I prefer the noodle version as you get it here. Slight variations on kuay jap nam sai also includes additions such as garlic, lettuce, fresh herbs or tofu. You actually find two type of broths. Nay Lek serves Kuay Jab Nam Sai which is a clear pork soup. The other version, which you might find in Convent road, is the dark version with five spices which is called Kuay Jab Nam Kon. And you will not have any trouble in finding the hawker either, at the entrance of the Old Market spot (Soi 11/Yaowa phanit). Nai Lek is the easiest stall to spot, as it’s by far the busiest, packed non-stop from six in the evening to late at night. If you’re lucky they might set up a new table for you in the middle of nowhere. 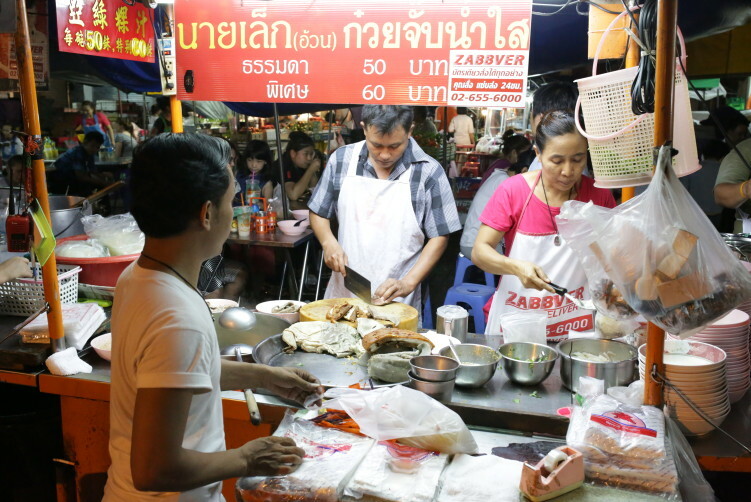 Most locals buy take away so they will understand that you’re there for a table unless you speak Thai. more info Food: Noodle soup with pork and egg (Kuay jab nam sai) – sometimes also written Guay Jab, Guay Jub, Guay Chap, KUay Jub or even Kuay Chaps due to the construction of the Thai alphabet. How to get there: It is basically at the heart of Bangkok’s Chinatown. Take the Metro to Hua Lamphong and walk or take a taxi from there. 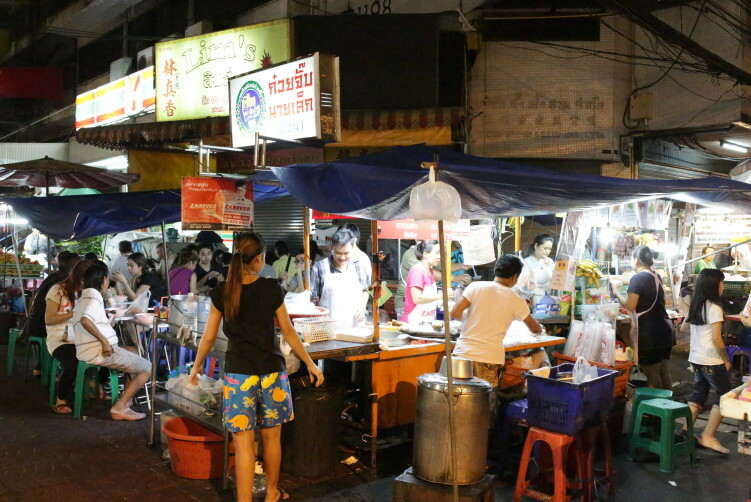 You find numerous stalls selling all kind of foods including Pad Thai, rice and curries, fruit and desserts at this intersection, but just look for the queuing if you arrive primetime.